Jakarta, May 13th 2016 - Archipelago International, is very proud to welcome Celebrity Chef Julius Bienert during his upcoming culinary tour throughout Indonesia. Julius Bienert is a Spanish celebrity chef who his famous for his television cooking series, “Go! Julius”, broadcasted on Canal Concina, one of Spain's leading television networks. During his tour for his upcoming docu-reality series called "nam nam", Julius is traveling the world in search of exotic dishes and new ways of cooking. In Indonesia, he will visit Yogyakarta and Bali specifically for their culinary traditions and unique delicacies. He wants to explore the farms, fields and oceans to discover where the food comes from, and he wants to learn how to prepare traditional cuisines using ancient cooking rituals. Archipelago International was chosen as the exclusive partner in Indonesia during Chef Julius' world tour, owing to its position as the largest hotel management chain in Indonesia with properties across the nation. Archipelago International also presents local food every month through culinary promotions in each region, and as such, Chef Julius is pleased to share his knowledge and experience of the culinary world whilst sharing tips and tricks with guests staying at Grand Aston Yogyakarta and Aston Kuta Bali – the two properties in which Chef Julius will showcase his cuisine. At Grand Aston Yogyakarta, Chef Julius will present an unexpected menu inspired by his cross-cultural culinary adventures, fusing Spanish and Indonesian cuisine to create a unique dining experience. 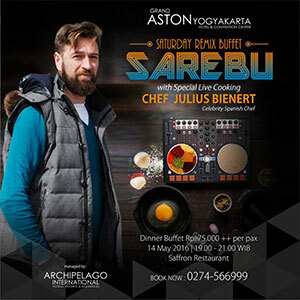 The event will be held on May 14th 2016 from 19.00pm where he will join the "SAREBU" Saturday Remix Buffet; a regular hotel tradition at Saffron Restaurant where guests can dine around the world at different culinary stations. Meanwhile in Bali, Chef Julius will present a menu that showcases the latest culinary trends at The Lighthouse Rooftop of Aston Kuta Bali on May 20th 2016, welcomed by a traditional Kecak dance.